With 2018 clearly in view, now is the time to start planning for events and training that will benefit our customers not just in the coming year but for all of their careers. At Chapman Company and DC Technology we are firm believers in educating our customers and creating networking and learning opportunities. 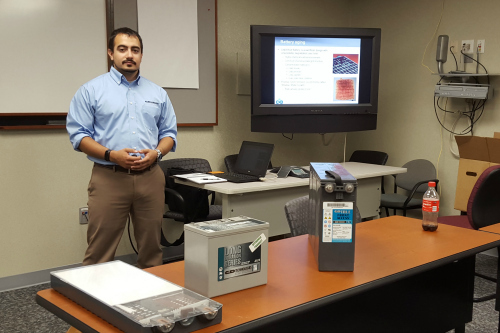 Coming in January 2018 we are pleased to be partnering with Eagle Eye Power Solutions to bring you an informative and useful training seminar on battery maintenance. Remote monitoring, data analysis, discharge testing and safety are just a few topics that will be covered. In addition, as a valued manufacturer partner, Eagle Eye Power Solutions will discuss how their products can be valuable assets for your battery maintenance and monitoring needs. We are hosting (3) events in January and hope that with the different locations selected you will be able to attend one of these very important training sessions. Lunch will be provided and we do ask that each company limit attendees to (2) individuals in order to broaden the participation base. Enrollment is limited to (25) individuals on a first-come-first-served basis. Please RSVP for the date and location most convenient for you using the links below. We look forward to meeting you! This entry was posted in Uncategorized on November 27, 2017 by dctechnology. We are pleased to announce our first “Battery 101” offering for 2017! This class will take place in Richmond, VA at the Holiday Inn Express ( 9933 Mayland Dr, Richmond, VA 23233) on May 23rd and May 24th, 2017. This is a one-day class so please register for only one of the available dates. There is limited space and the classes typically fill up very quickly. We also ask that each organization is represented by a maximum of (3) attendees. This ensures that we have a good mix of individuals from different industries and experience levels. The more well-rounded the group is the more everyone benefits from class feedback and interaction. Please click on the link below for the RSVP form and further details about the training. This entry was posted in Uncategorized on March 31, 2017 by dctechnology. As fall settles in upon us, we would like to take a brief moment to reflect on a busy summer of training and networking. At DC Technology, we pride ourselves on educating our customers and continuing those relationships as well as forming new ones. Once again, we had a huge response from customers eager to learn more about DC Power and network with their peers in the industry. We had a great mix of power players from the utility, telecom and data center worlds. Even the most seasoned industry insiders always relate to us how much they enjoy and appreciate these trainings. Everyone learns something new and walks away with the reassurance that DC Technology will be there for them when a DC Power opportunity presents itself. We kicked things off with two, one-day sessions here in our Charlotte, NC office. Even in the middle of summer, the response from our customers was overwhelming and we had a packed house both days. Our insides sales and customer service staff is based out of this office so many of our attendees got to meet these folks in person that they have been speaking to on the phone for years. It is always a great thing to meet our customers and we truly appreciate their taking the time to be here. In August we hosted two more, one-day sessions in Richmond, VA for our valued customers to the north. Eric Layman (DC Technology, VA territory manager) spearheads this event and as in Charlotte, the response was tremendous. We had customers traveling from rural Virginia and several states away just to join us for this event. We say it time and time again, “an educated customer is the best kind of customer” and DC Technology is committed to providing this valuable service to them. A lot of work goes into planning these events but after several years of hosting them, we know for a fact that our company as well as our customers benefit. 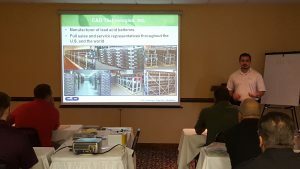 In addition to the annual events mentioned above, DC Technology is always willing to provide a smaller scale training at your request. If you have 10 or more persons interested, we can even come to your location at a time that best suits you. Please visit our site regularly for news about upcoming training and educational opportunities. In addition, you can always use the “contact us” section of our website to request training or more information. As always, we appreciate your business and your interest in our products and services. DC Technology is ready to assist you in any way we can. Rex Cochran –Inside Sales Coordinator – Chapman Co. & DC Technology, Inc. This entry was posted in Uncategorized on October 10, 2016 by cathy.